I'm usually reluctant to recommend, or for that matter, play, a lot of early access games on Steam. I simply prefer to judge the finished, hopefully polished, product. However, I'm going to make another exception with this months entry. 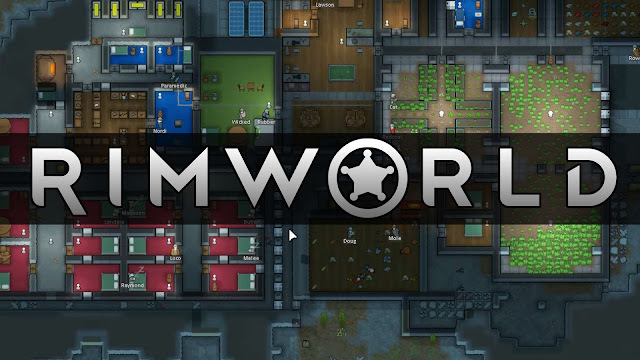 Rimworld is another game that, on first glance, seems to fit neatly into the procedural survival / base building mold. For me however it manages to set itself apart from others of it's ilk due to how often it manages to generate interesting and memorable game-play scenarios through it's various systems. Most importantly, and particularly impressive for a procedural game, it manages to create interesting stories and characters. On the surface all the ordinary things are here. You are crashed colonists trying to survive on an alien world. You collect resources, build your base, expand your research tree, and build a better base, all while trying to deal with whatever disasters have befallen your poor colonists. The first difference is in the AI direction of your colonists. You don't give them direct orders alone this time. Rimworld has a series of AI priorities that you can set for each colonist, and they will perform the tasks depends on what categories you have assigned each colonist too. It's kind of a mini-game about discovering efficiency. How many people should be assigned to things that will collect and cook food supplies? How many should build stuff, or collect resources? The 'importance' of each task depends on your situation and your colonists skills, so it becomes a little puzzle game about assigning roles. Once you set those priorities the colonists will go about their tasks accordingly without direct intervention. There is a certain satisfaction from seeing the logic machine you construct playing out exactly as you intended. The AI is a neat twist, but it's all stuff you have seen before. Build an efficient base, manage resources, upgrade your base, respond to things happening. That's not where the true fun lies however. In many ways the game succeeds for me in the same way that X-Com succeeds. It makes me care about my team. The colonists have just enough randomly generated traits and relationships that then leads me, as the player, to imbue them with character and personality. This game constantly tells me stories. They are often funny, exciting, or memorable. Yes, sometimes they are dumb in ways only a procedural system can generate, but even then you develop a certain affinity for them. Each character gets just enough of a profile that you develop attachments to them. They also forge their own relationships Sims style, with love affairs, relationships, and even marriage further complicating your tasks. The colonists develop traits and personality flaws based on their abilities and the base around them. Some are vain and selfish, some naive to a fault. Some fight or hunt well, some do not. Some are smart, others not so much. It all impacts their effectiveness, but also leads to other interesting scenarios playing out. Your doctor might refuse to treat a love rival. One of your colonists might snap and start starting fires to get attention. They feel like actual characters even when it is all created with some procedural generation. The game gives you just enough hints of a real character that you quickly find your imagination filling in the blanks. They get happy, sad, lonely, excited, and it all impacts the colony one way or another. The game tells stories. Those stories are often memorable. When a game does that consistently I tend to enjoy it!